Figures released today (6 August 2018) reveal that deaths related to drug misuse in England have fallen, with 2,310 deaths in 2017, compared with 2,386 in 2016. While this is not statistically significant, we welcome the good news that the recent trend of large annual increases in deaths has abated. However, this overall decline is confined to men; deaths among women continue to rise and we need to better understand why this is so. Each one of these deaths is a tragedy and represents a missed opportunity to help some of the most vulnerable people in our society. We must also bear in mind that these figures only include overdose deaths, whereas the reality is that many people are dying from health conditions caused by a lifetime of drug misuse. Today’s figures show a massive and growing regional discrepancy in drug misuse deaths. Rates of deaths were highest in the North East of England, at 82.7 per 1 million of the population. The lowest were in London, with a rate of 24.3. This is a stark reflection of the link between drug-related deaths, poverty and social exclusion. If we want to lower the rates of deaths, focusing on drug policy will not be enough. While overall opiate-related deaths are decreasing, there has been an increase in fentanyl deaths from 58 to 75. There are indications that fentanyl is being used as an adulterant in heroin, and this situation will need to be monitored closely. The troubling increase in cocaine deaths which have grown almost four-fold since 2011 continues. ONS believes that the increased prevalence and purity of cocaine lie behind this. In contrast, deaths from NPS have halved, perhaps as a result of the 2016 Psychoactive Substances Act. However, this raises the possibility that an unintended consequence of the Act might have been an increase in cocaine use and associated harms. As in recent years, the 2017 figures display a discrepancy between age groups. The stark increases in deaths witnessed over the last few years have largely been driven by the older age groups, consisting of the ageing cohort of heroin users who started using at the height of the heroin epidemic in the 80s and 90s. Their years of drug use, often combined with alcohol misuse, poor mental health, homelessness and other connected issues, has meant that they are particularly susceptible to overdose. 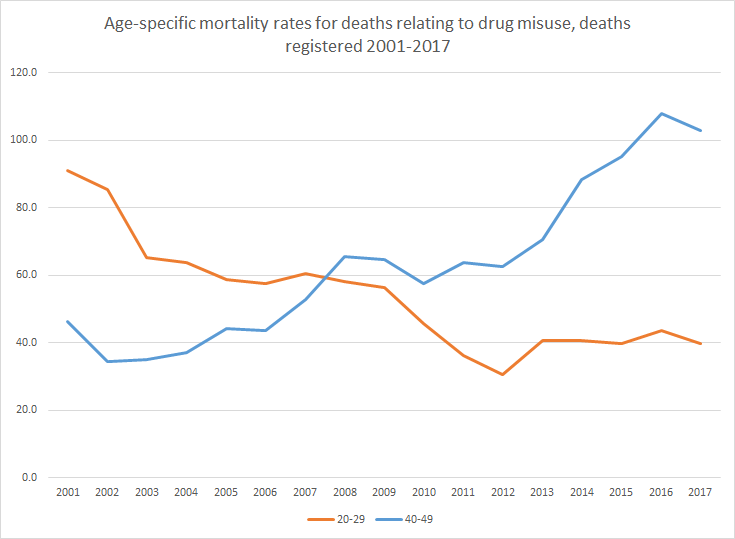 However, while we should not be complacent about what is happening to the younger groups, it is encouraging that the slight increase in deaths among those in their 20s seen in 2016 has been reversed in 2017. We know that the single biggest thing we can do to minimise deaths is to engage people in drug treatment. However, we also know that 40% of opiate users and 36% of crack cocaine users are currently outside treatment, and that the fragmentation of the system means that only 1 in 3 people who have an identified treatment need on release from prison make it to a community treatment service, a time of heightened vulnerability. Wide-spread provision of Naloxone is vital, particularly for those who are going through periods of transition or who are outside treatment. This is all happening against a back-drop of continuing disinvestment, with figures released in June showing that local authorities are planning to spend £34 million less on substance misuse treatment in 2018/19 than they did in 2017/18, a total reduction of £151 million compared with four years earlier. Similar reductions in investment in treatment in prisons have also taken place. Without action to halt this disinvestment, the ability of the substance misuse treatment system to meet the needs of an increasingly vulnerable population of drug users is severely compromised. Last year, Collective Voice and the NHS Substance Misuse Provider Alliance, with the support of Public Health England, published a set of best practice principles to help treatment services address the current crisis in deaths related to drug misuse. We will continue to work with others in the sector to implement this, as well as to continue to champion treatment and ensure that high quality services are available to all those who need them.